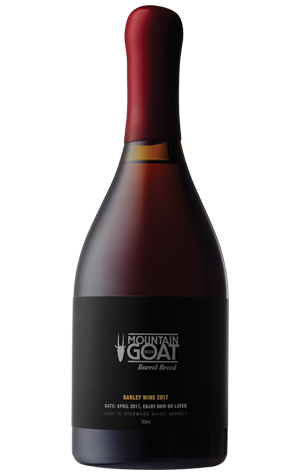 Two years ago, Mountain Goat got its barrel program off to a flier when the first beer to emerge from the Barrel Breed program was named Champion Australian Beer at the Australian International Beer Awards. Understandably, they've continued to brew the beer once a year since, ready to be released in spring. For the first two releases, the beer was aged in Lark Distillery barrels from Tasmania; this time, they've sourced them from closer to home: Melbourne's Starward. With Starward's whiskies typically possessing a youthful juiciness, the beer is the sweetest of the three Barrel Breed barley wines to date. As in previous years, the base beer was kept simple, although, according to the Goats, Melbourne's crazy summer – with its big swings in temperature– caused the uptake in character from the barrel to be quicker than in the past. Certainly, the booze is swiftly apparent on the aroma, poking through the malt sweetness in a manner that suggests a few months or more in careful storage will make for a mellower and more integrated beer.